I now work for AABB (American Association of Blood Banks) as the Director for Consulting Global Services. I work in sub-Saharan Africa primarily and also in Washington, DC and St. Louis, MO. I remarried in 2014 and now reside when I am home in Maryland Heights, MO, a suburb of St. Louis. Christine Vernasco Bales has a birthday today. 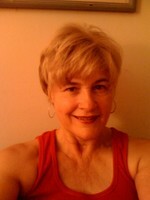 Christine Vernasco Bales updated her profile. View.